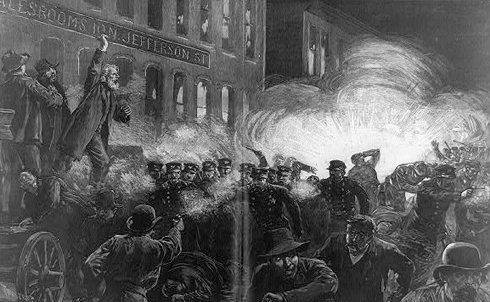 What began as a rally in support of striking workers and the push for an eight-hour workday quickly turned into one of the worst police massacres in American history when a bomb was hurled at police officers dispersing the crowd in Chicago’s Haymarket Square on May 4, 1886. The explosion and the melee that ensued as the police opened fire resulted in the deaths of eight police officers and an unknown number of civilian deaths. In the show trial following the massacre, eight rally organizers were charged with the murder of the police officer killed by the bomb, even though prosecutors admitted that none of the men had actually thrown the explosive device. All eight were convicted of the crime they did not commit, and on the night before four of them were hanged, The Nation reported that two thousand people walked down Broadway in New York “bearing red flags and black banners inscribed with incendiary sentiments.” After the executions, a funeral procession through the streets of Chicago wore red ribbons and sung the Marseillaise. Out of this travesty of justice arose the International Workers’ Day and the progressive tradition of May Day as we know it today. In the decades since the massacre, the workers’ movement has won a host of government reforms, union advances and a political approach that eliminated some of the worst horrors associated with industrialization. To mark this tragic event, but also to celebrate the great victories that came in its wake, we have assembled a collection of articles and images from The Nation’s archives in the following slides. It’s a very incomplete but, we hope, inspiring collection of some of the highlights of US labor history over the last 100 years. One century ago this year, on March 25, 1911, an infamous fire spread through the Triangle Shirtwaist Factory in New York City’s Greenwich Village, killing 146 mostly female workers who were trapped on the building’s upper floors. As Joshua Freeman explains, the tragic fire captured the country’s attention in a way that no industrial disaster ever has before or since, but not only for the scale of destruction or loss of life. The fire remains such a touchstone for the American labor movement because it fulfilled “a deeply held belief, or at least a yearning to believe, that good can come out of suffering, that death does not have to be in vain" and because it led to far-reaching changes in factory regulations on safety. 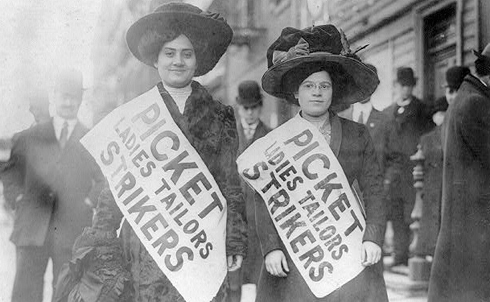 But, courageously led by Clara Lemlich and the International Ladies’ Garment Workers’ Union, the workers ultimately won significant victories, as most of the garment factories became union shops and the industry workweek was capped at 52 hours. 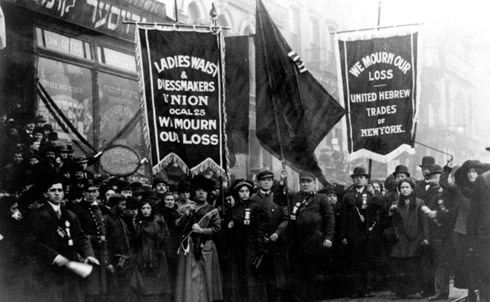 Significantly, one the factories that was not unionized during the uprising was the Triangle Shirtwaist Factory, and a mere two years after the strike, the factory’s shoddy conditions led to disaster. 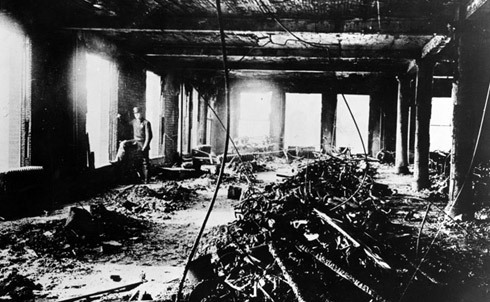 A fire broke out on the eighth floor of the building near the end of the workday on March 25, 1911, and with doors locked to prevent stealing and early release, inadequate fire exits and shop floors laden with flammable materials, the flames quickly spread to the ninth and tenth floors. Desperate women, children and men trapped in the inferno were forced to choose between being burned alive or jumping to their deaths on the streets below. After World War I, high inflation made it difficult for poorly-paid industrial workers to survive. In 1919, the unrest reached fever-pitch as steel workers across the country, mainly immigrants, struck against the United States Steel Corporation. Other workers steadily joined on as the “great steel strike” grew to more than 350,000. After three months, government officials called in the National Guard and federal troops to violently quell the strike in many cities. Employers also incited a red scare by framing the immigrant protesters as foreign instigators of radical ideas. As George Soule wrote at the time, the strike was considered a failure, and led many to wonder whether the trade-union movement was “fitted to carry out their responsibility to the workers in the matter of leading and winning” their members’ struggle for greater workplace rights. With industrialization, children began whiling away long hours on factory floors or in garret workshops in low-paid jobs. 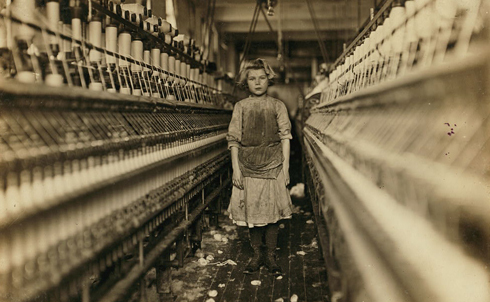 But the labor movement pushed for protections for child workers, and forced the creation of the National Child Labor Committee in 1904. 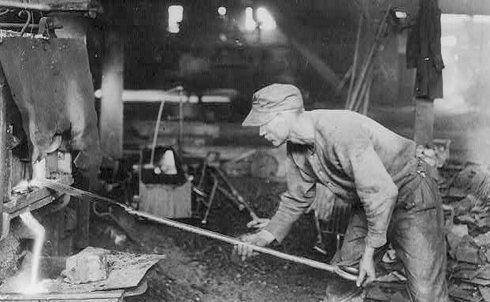 In 1913, The Nation wrote that “child-labor legislation is “spreading over the country with a rapidity greater than its most sanguine advocates could have expected a few years ago.” But it wasn’t until the Great Depression, when desperation became so enveloping that adults began accepting the same wages as children, that child labor effectively ended. 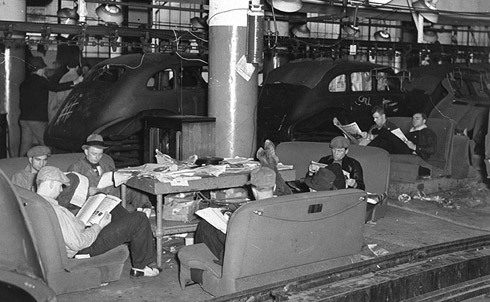 In a few short months in 1936 and 1937, the United Automobile Workers of America, transformed from a union of 30,000 into a “seasoned fighting organization of 400,000 members and in the process piled up some 400 contracts.” The union had taken on the giant and secretive General Motors by organizing a dramatic sit-down strike in the company’s factory in Flint, Michigan. Besieged by police and a ruthless management, the Flint strikers occupied their factory for weeks, refusing to leave despite tear gas and threats of violence. 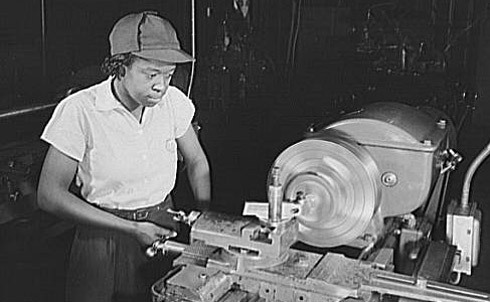 Held to account by a powerful union movement and early civil rights leaders such as A. Philip Randolph, President Franklin Roosevelt’s administration facilitated major advances for labor and for workplace equality. In 1941, Roosevelt created the Fair Employment Practice Commission, which forbid discrimination based on race, religion, or national origin in defense industries. 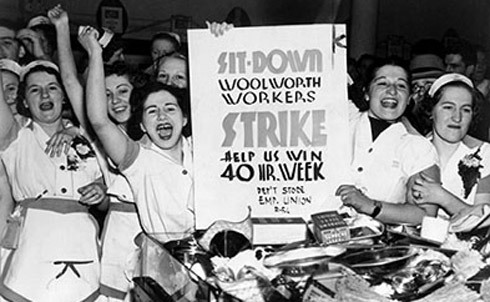 The Taft-Hartley Act and similar anti-union legislation of the late-1940s were designed to slow labor’s growth, but by the middle of the next decade, the proportion of the workplace organized into unions nevertheless hit its historic high of over 30 percent. 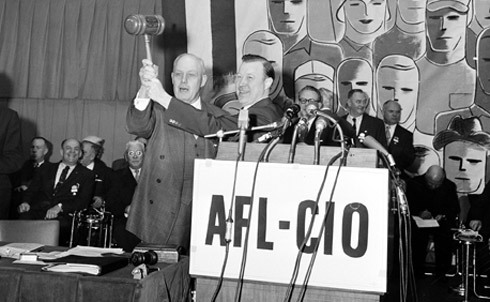 In 1955, to build on labor’s forward momentum, the Congress of Industrial Organizations merged with the American Federation of Labor to create the AFL-CIO. This brought some 160, 000 workers together into the largest federation of organized labor in the US. 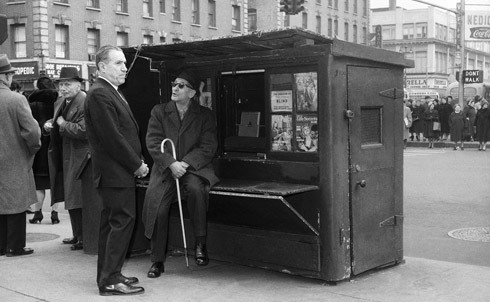 From December 1962 until the end of March 1963, the American Newspaper Guild led the newspaper industry on its longest strike ever, with the nine affected newspapers losing over $100 million. The guild, as John Scribner wrote in 1934, provided a fundamental pubic service by helping readers determine whether papers were published in the public interest. “Few will be fooled by a newspaper that professes liberal editorial policies but deals with the guild in a reactionary manner,” he explained. Building on his experiences as a farmworker and community organizer in the barrios of Oakland and Los Angeles, Chavez did what many thought impossible—organize the most vulnerable Americans, immigrant farmworkers, into a successful union, improving conditions for California’s lettuce and grape pickers. 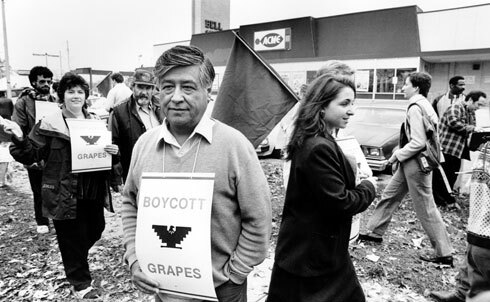 Founded in 1960s, the United Farm Workers pioneered the use of consumer boycotts, enlisting other unions, churches and students to join in a nationwide boycott of nonunion grapes, wine and lettuce. Chavez led demonstrations, voter registration drives, fasts, boycotts and other nonviolent protests to gain public support. Though Chavez is an increasingly controversial figure among progressives with critics indicting him for a dictatorial manner and anti-democratic-tendencies, the UFW inspired and trained several generations of organizers who remain active in today’s progressive movement. 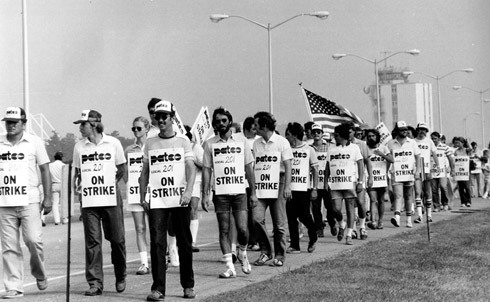 The Taft-Hartley Act came back to haunt American labor in 1981 when President Ronald Reagan claimed that the striking Professional Air Traffic Controllers Organization (PATCO) union was in violation of the act’s prohibition against such actions by government workers. After ordering all air traffic controllers back to work within 48 hours, Reagan fired more than 11,000 workers who had disobeyed his order, and barred them from federal service for life. When employers started laying off workers to save their own skin as the economy took a turn for the worse in the late 2000s, embattled employees were left to fend for themselves. 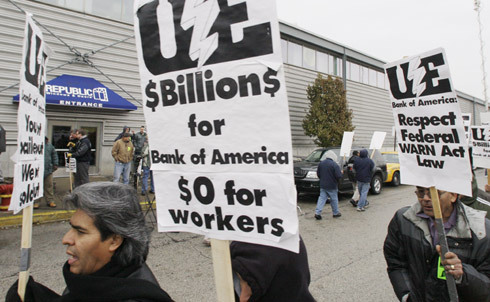 In one of the more egregious cases, after Bank of America refused to extend operating credit to Republic Windows & Doors in 2008, a Chicago-based manufacturer, the firm disregarded federal rules that require sixty days notice of a plant closing and announced that its factory would be closing the plant immediately. While US sweatshops in the early twentieth remain a stain on US history, the reality is that in America we haven’t completely rid ourselves of them. 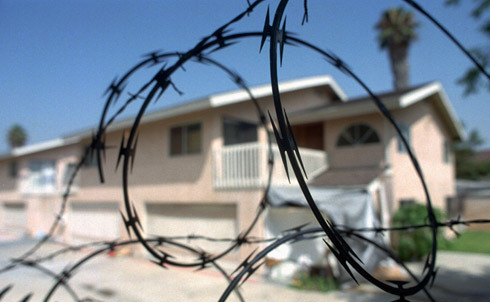 Robert Scheer recalls in The Nation the release of Thai slave workers at a garment factory in El Monte, California in 1995. The slaves had been held in a prison sweatshop, not allowed to leave the compound for years, making $2 an hour. Scheer writes that the circumstances for the El Monte slave laborers were not a huge departure from the appalling conditions he had witnessed on other federal and state agency raids of California garment factories. 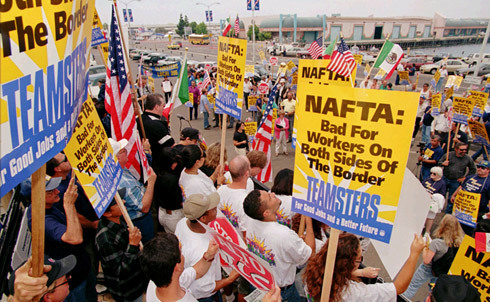 The sweatshops predominantly employ Asian and Latin American immigrants “whose status as fugitive workers meant that, de facto, they did not enjoy the standard protections provided by labor, occupational safety and health laws.” The desperation of these laborers leave them at the mercy of their employers, and many arrive in global smuggling operations charging immense sums that take years to pay off. 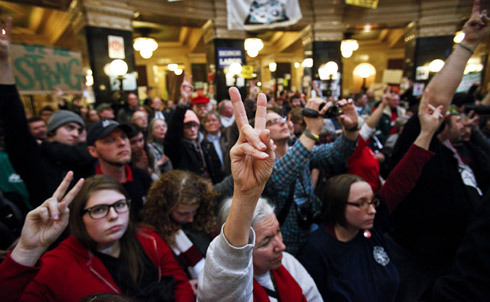 Wisconsin Governor Scott Walker’s attack on his state’s unions this spring thrust labor back into the spotlight for many Americans, and underscored that many of the lessons we thought we had learned from the Triangle Fire need to be relearned. Thousands of workers die every year on the job, and tens of thousands more die from occupational diseases. Large segments of the labor force remain almost entirely un-organized, and undocumented immigrants continue to operate in a legal limbo that makes them ripe for employer exploitation. All a reminder, writes AFL-CIO’s Tula Connell, that the "Triangle fire, a symbol of Gilded Age greed, still stands burning before us." Read Connell’s piece detailing the challenges facing organized labor, and offering resources you can use to protect your own workplace rights.